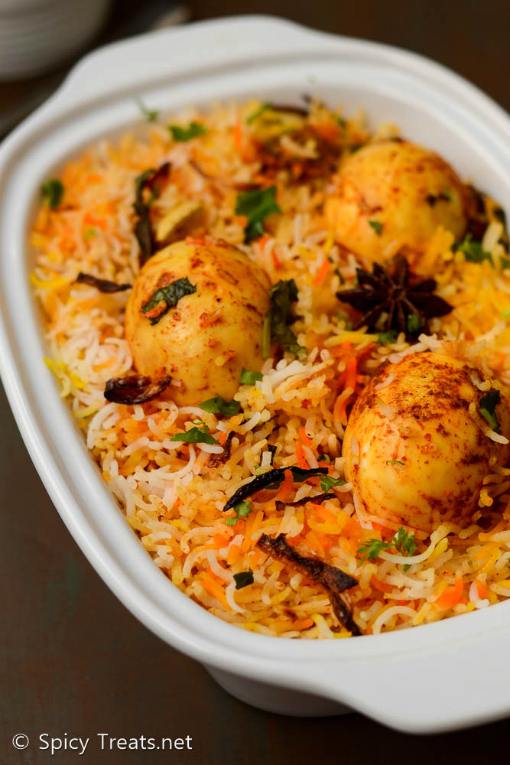 And occasionally for a change try Dum Biryani method - cooking rice and gravy separately and set to Dum, this way the biryani gets maximum flavor and taste. But at the same time, it is bit challenging task too, cooking rice perfectly with soft and separate grains is the big challenge for me. Also the amount of the liquid(curd or water) you add to the gravy also matters. After few attempts this time got it perfectly. 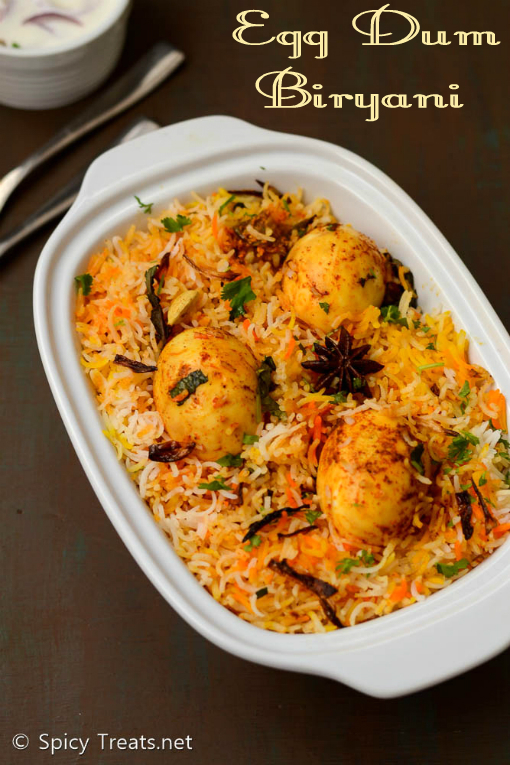 I used store bought Shan Biryani Masala for this Egg Bum Biryani Recipe. 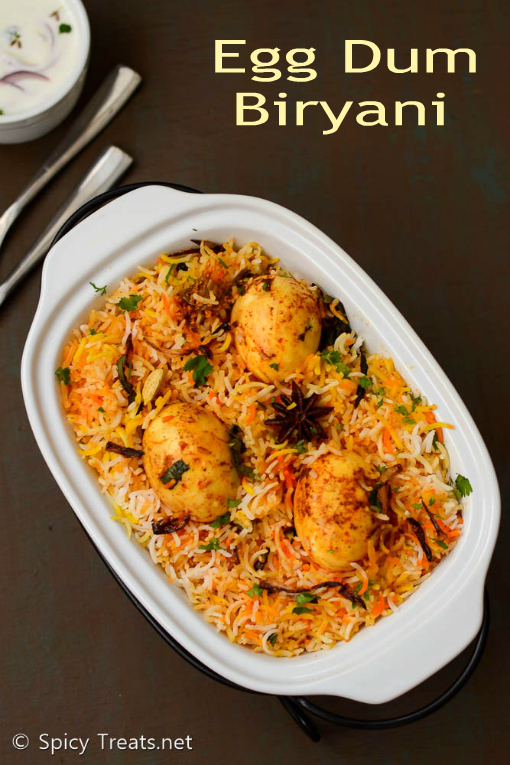 This method is so easy to make and the result was super delicious Egg Dum Biryani. I will update the step wise pictures sometime soon. Orange Food color a pinch mixed with 1 tbsp milk or water. Yellow Food Color a pinch mixed with 1 tbsp milk or water. and then switch off the stove and let it rest for another 2 minutes. And then strain the water and fill the pan with cold water and remove the shell from eggs. Now Make Masala Egg - heat 2 tsp oil in a frying pan, when it is hot add chilli, turmeric and garam masala powder let it sizzle and add the boiled and peeled eggs and stir fry for a minute. Then switch off the stove and keep the masala egg aside. After that, make fried onions, for this heat oil in a kadai, then mix the sliced onions with corn flour and when the oil is hot add the onions and fry until crisp and golden brown. Transfer the fried onions to a paper towel and keep aside. Now boil 8 cups of water in a large quart pan, add cardamom and oil when it starts boiling add the soaked and drained rice and cook till it is 80-90% done. When you press the rice it should be soft and should not broke into half(if it broke then rice has to cook for some more time) and also it should not get mashed. Once rice is done, drain it in a colander and keep aside. After that heat oil in a heavy bottomed pan, when it is hot add star anise, bay leaf fry well and then add sliced onion, green chilli, some chopped mint and cilantro. Saute onions until it is soft and translucent then add ginger garlic paste and fry till raw smell leaves. And then add chilli powder, biryani masala powder stir fry well and add yogurt, enough salt stir well and cook in medium heat until the gravy starts boiling. When the gravy starts boiling add some more cilantro and mint leaves and simmer for 2 minutes. Now after the gravy thickens slightly add layer of rice, then add some fried onions, masala eggs, some fresh cilantro and mint leaves and also orange and yellow food color. Then cover the pan with clean kitchen towel and close it with lid and turn the heat to the lowest point and let it cook in Dum for 20-25 minutes. After that switch off the stove and do not open the pan for another 2-3 minutes. And then open the lid, remove the kitchen towel and fluff the rice gently and Serve Hot with Raita. Shah Biryani Masala, has whole garam masala in it so I did not add whole garam masala while tempering. If you use different biyrani masala you can use whole garam masala for tempering. Use fresh curd, beat the curd until smooth and creamy then use it in the recipe. 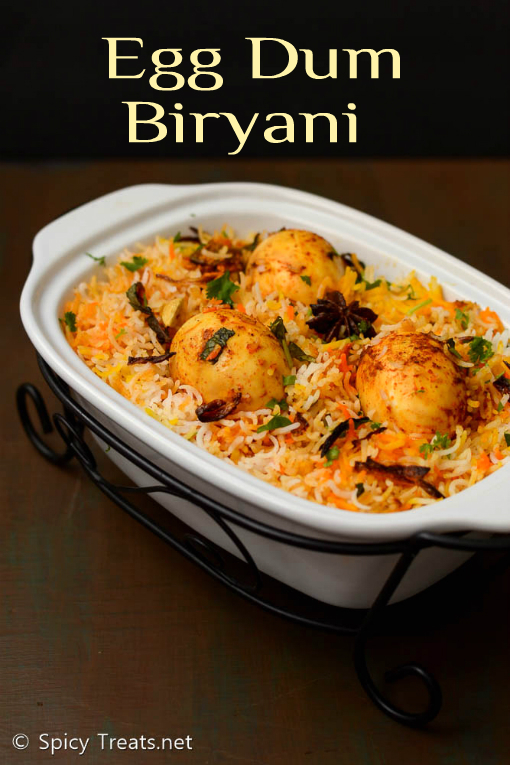 It is good to use soft boiled eggs for Dum Biryani Method. Adding corn flour or rice flour to the sliced onions helps in getting crispy and flavorful fried onions. 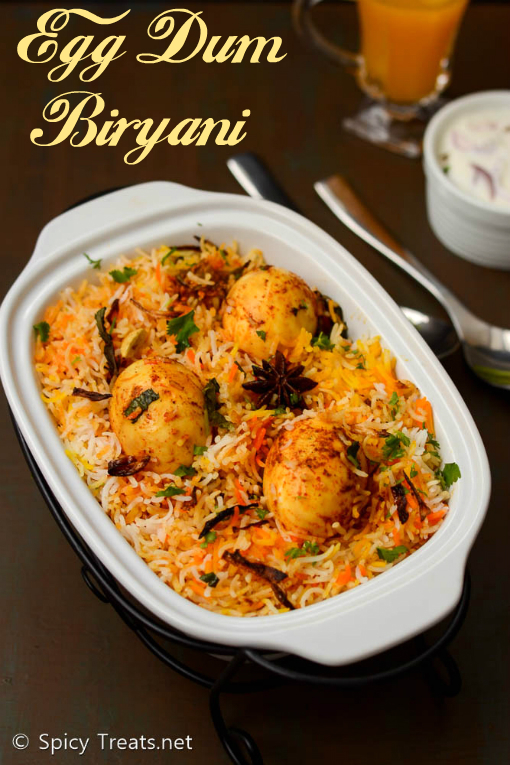 Biryani looks fabulous, Sangee! Delicious and flavourful! Love the presentation! 50 gm biriyani masala - 2 tsp would be sufficient? You need to add 2-3 Tablespoon of Biryani Masala. Thank you, any biriyani masala is fine, or only Shah biriyani masala? I recommend Shan Biryani Masala for Dum Biryani, it gives restaurant style taste and flavor. In shan masala, you could see powder and whole spices that's why i did not use any whole garam masala(clove,cardamom,jeera,cinnamon) while tempering but other brand masala may differ. so, add spices accordingly. Yes., you can also use other available brand.